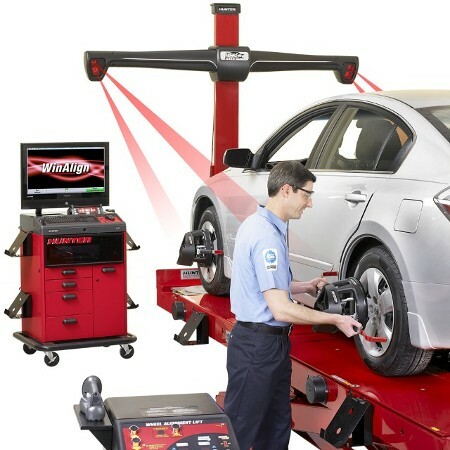 To maintain a smooth ride and protect the wear-and-tear on your tires, trust Taylormotive for the best computerized wheel alignment in North Vancouver. Our state-of-the-art system ensures the wheels on your vehicle are accurately aligned for perfect weight distribution and even tread wear on the road, extending the tread life on your tires and saving you money over time. For maximum safety and minimum wear, the wheels of your vehicle need to be aligned so the wheels remain parallel to each other and perpendicular to the ground. During normal vehicle use, the wheels eventually fall out of alignment; periodic computerized wheel alignment resets the angles of the wheels so they are again positioned correctly. Because the front two wheels receive the most impact during regular driving, front end alignment is generally the highest priority; however, occasionally alignment needs to be performed on the back end or all four wheels. Why Is Computerized Wheel Alignment Important? Normal wear-and-tear while driving will cause the angles of the wheels to change over time. Additionally, significant impacts like minor collisions, driving over curbs or deep potholes can instantly throw your wheels out of alignment. Wheels that are unaligned by even an imperceptible amount can increase the friction of the tires on the road, lowering fuel efficiency and causing accelerated and uneven wear on the tires. This also creates additional stress for the suspension and steering systems of your car, which may also require servicing at some point. Finally, bad alignment can cause the vehicle to “pull” in one direction or the other while moving, making it more difficult to control and reducing overall safety. Vehicle alignment can easily be corrected. Taylormotive’s computerized wheel alignment in North Vancouver realigns your wheels with a level of accuracy that the human eye and mechanical instruments can’t match, making your car safer to drive and extending the life of your tires and suspension. For best results, it’s a good rule of thumb to have your alignment checked every 10,000 miles or so under normal driving conditions. You should also have it checked after driving on exceptionally rough terrain or after a significant impact like a pothole or curb. Taylormotive has been providing quality service and auto repair in North Vancouver for nearly 6 decades, and our trained staff is prepared to see to your needs. As your local mechanic we provide everything you need from collision repair to oil changes. To learn more about computerized wheel alignment in North Vancouver or to schedule an alignment check, call us at (604) 985-7455.